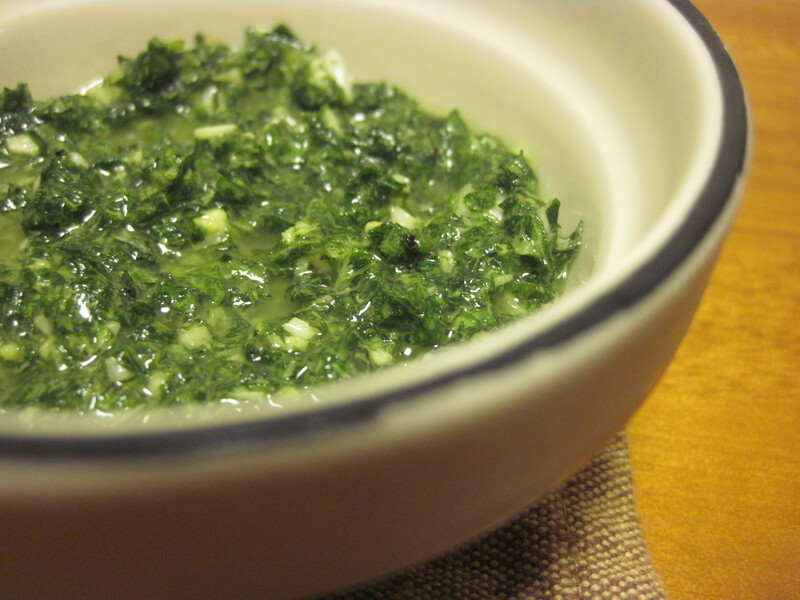 when it comes to sauces, pesto is one of the best. the zest of fresh basil, the freshness of olive oil, and the heat and vigorous flavor of fresh garlic compliment each other for a winning combination. add a little black pepper, some salt, and a little lemon juice, and things only get better. everybody touts their own version of pesto. some people say it needs pine nuts. some people say it needs parmesan cheese. some people say it needs shaved black truffles and thinly sliced $100 dollar bills. but don’t listen to them. listen to me. the only things pesto needs are some kind of fresh herb, garlic, olive oil, and salt. notice that i said “some kind of herb” and not “basil.” that is because, in my humble opinion, most members of the mint family and even a few other herbs can be used as a substitute for basil. which is good news, because basil is hard to find in japan. 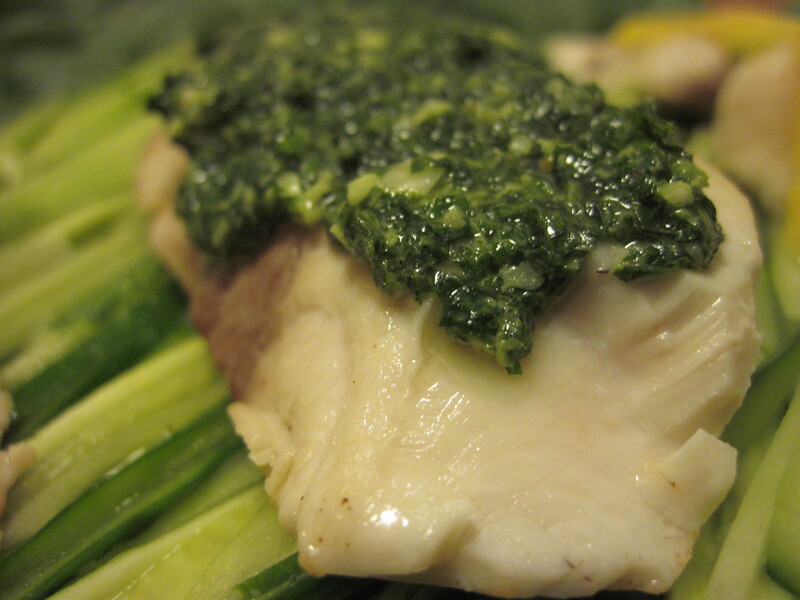 shiso, however, is not. and it is delicious. i’m sure you can guess where this is going. cut the stem off of the shiso leaves. make sure the leaves are rough side up, and then roll them tightly. why rough side up, you say? because most of the aroma and zesty oils of the shiso leave are located on the rough, pale side of the leaf, and we can’t have you going and rubbing all the goodness off on your cutting board. slice the roll thinly, and then mince the leaves as finely as you can. add them to a small bowl. peel and slice the ends off your garlic. mince super finely and add to your shiso. i generally don’t worry too much about the consistency of the garlic, mainly because i don’t mind huge chunks of garlic in my food. my dad was all about making me eat raw cloves of garlic with every meal, so that may have rubbed off on me a little. add a few squirts of lemon juice. douse in a generous amount of olive oil. if you want a very saucy pesto, use more olive oil. if you want more of a paste (which is what i normally make because it tends to work better as a topping for meats and fish), use less. follow up with some salt and pepper to taste. add the mixture to a blender or food processor and pulse until smooth. this isn’t so important when using basil, but shiso tends to have a texture that is a little bit rougher, which can be hard to handle for some people. spread on toast, thick slices of tomato, crackers, or pasta. keep in mind, this stuff is concentrated, so don’t go slathering your foods in it unless you want to cause world war iii with your breath and body odor. makes enough sauce for about 2 meals. I love shiso! I was thinking of making this more Japanese by using rice bran oil with a bit of sesame oil and ginger. Maybe with yuzu infused vinegar that I made after finding fresh yuzu fruit earlier this year. I could even use sansho instead of black pepper and maybe some green onion. Ooooh…The possibilities are endless! Btw, I’m Japanese. Go figure. Lol! Serve with cold soba noodles! For some reason I can’t figure out, Shiso grows abundantly here in the wild in south Texas. Perhaps it is an escapee introduction. At any rate it loves its new home. I have used it to make little rolls of meat and rice Korean style, which is delicious, I also harvest the seeds to grind and use as a spice. Now I have a new use use for it. Why buy basil when its cousin grows wild in the woods. I think pasta with pesto is on the menu tonight. Thank you for your recipe! Wild green shiso is abundant in shady urban areas of Chattanooga, TN. So are spearmint and apple mint. I’m in Ontario, Canada and a friend sent me some shiso seeds which germinated. I now have indoor shiso plants with HUGE leaves. I could transplant them outside but I’m not much of a gardener. The pesto I made with it is delicious. I added some miso paste as a recipe on another blog suggested.